Turning your passion for music into a rewarding career as a band director will require some preparation. Band directors need to fine-tune their vocal or instrumental talent to lead musical groups during performances and/or recording sessions. Band directors can lead singers and musicians in schools, universities, concert halls, orchestras, religious organizations, recording studios, and more. Band directors play a prominent role in both selecting the musical arrangements performed and giving advice for optimal performance. Although the employment of band directors is expected to be slow, growing by just five percent, there’s expected to be 3,500 new jobs created by 2022 as people increase their attendance at musical performances. The following is a step-by-step guide for how you can reach your musical dreams as a band director. Starting in high school, you should be actively participating in the band program, school choir, or other community music organizations. You’ll need to be extremely proficient in at least one traditional band instrument, such as a trombone, tuba, flute, clarinet, or saxophone. Practice makes perfect, so put in the effort to master your instrument. The more you play, the better your breathing, tone, dexterity, and muscle memory will become. Having an in-depth knowledge of instruments is essential for band directors to create awe-inspiring musical performances. The majority of band directors need to have at least a four-year bachelor’s degree from a higher learning institution accredited by the National Association of Schools of Music (NASM). Aspiring band directors typically will major in music, music theory, musical composition, conducting, or music education based on their future goals. Before being admitted, applicants to music schools typically need to submit a recording or audition in person to show off their pipes. Seeking additional training through music camps, internship, and fellowships is also advised. After earning an appropriate music degree, graduates will likely need to gain relevant work experience in the music field to advance into band directing. Usually, band directors will start as musicians in a group, choir, or orchestra to learn the true lay of the land. Use this time to improve your instrumental expertise and better understand how musical groups function cohesively. Band directors need to have exceptional discipline, interpersonal abilities, determination, and decision-making skills for great leadership potential. While this final step isn’t required, it’s important that practicing band directors consider continuing to improve their craft by attending graduate school. Earning a master’s degree in music can unlock added job opportunities too. For instance, conductors in symphony orchestras generally are required to hold an accredited master’s degree. Going on to obtain the Doctor of Music (D.M.) or Doctor of Musical Arts (D.M.A.) can also be beneficial for band directors looking to lead musical groups at the college or university level. 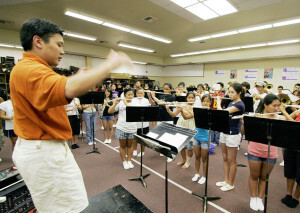 It’s important to note that band directors wishing to teach instrumental music in middle or high schools will need to possess at least a bachelor’s in music education and obtain state teaching licensure. Of course, this step only applies to school band directors, but there are several other orchestras, bands, choirs, and glee clubs directors can lead. If you follow these steps to become a band director, you’ll use your creative leadership to plan and direct musical performances for a standing ovation.